Scientifically speaking, the human brain has right and left hemispheres. Speaking generally, the left controls logic and reason while the right deals in emotion and words. Socially, we equate these hemispheres with gender stereotypes; often seeing women as right-brained and men as left-brained. I am of two brains about “The Vow”. The male half of my brain despised watching a movie about a sinuously muscular, passionate, patient, music studio owner walking around mostly naked, feeding and nuzzling cats, while fighting for the love of an indifferent woman. The female portion of my brain enjoyed watching a movie where people had to start their life over from scratch to determine what portions of it were honest and real, or merely affectation and reaction. Knowing When To Say “When”. After Harrison Ford completed work on 1989’s “Indiana Jones and the Last Crusade”, he took a break from playing the kind of rogue charmers that he had become known for. He began taking vulnerable roles in poignant dramas and mysteries. While some critics enjoyed his work in films like “Regarding Henry” or “Frantic”, audiences didn’t seem to take much notice. While Ford’s acting skills were on the rise, his box-office appeal was in decline. During Ford’s early 90’s, box-office downturn, a new actor emerged as the prime candidate to step into the spotlight that middle-aged stars like Stallone and Bruce Willis were beginning to vacate. The stunningly handsome Alec Baldwin was capable of providing audiences with both intensity and machismo (Malice) while wielding a gun and cracking wise (Miami Blues). He was a natural choice to take the role of “Jack Ryan”, a character created by national security novelist Tom Clancy. Jack Ryan was a post-Soviet, James Bond type, American hero- prepped to fight the information age’s war on… what ever came next. When Baldwin appeared as Jack Ryan in 1990’s “The Hunt for Red October”, America enjoyed it so much that they completely ignored Sean Connery’s abysmal Russian accent. What is it about submarine movies that requires so many terrible accents? With a decade of novels on store shelves, Clancy was set to be the next Ian Fleming, and Baldwin was set to be the next Sean Connery. But then Alec Baldwin lost the role. It’s rare that a movie about sports is actually very good. For every “Hoosiers” and “Rudy” there are countless bombs like Caddyshack II, The Air Up There, and Rocky V.
Movies about sports are usually terrible because the production company has to find good actors who are also good athletes. This is harder than it sounds because in high school; the people on stage for the sophomore production of “Twelfth Night” are very rarely the same people receiving varsity letters for wrestling. Because of this challenge, sports movies often tip in one of two directions; well acted films filled with overly choreographed, turbocharged sports montages (The Blind Side) or believable action sequences tastefully rendered against a backdrop of acting makes the “Mighty Ducks” look like a shoe-in for the Palme D’or. On the outside chance that a casting director can find someone with the ability to act AND punch at Hilary Swank levels, they still have to pair them with a good director and a great script… which only guarantees that a picture can still be as bad as “He Got Game”. 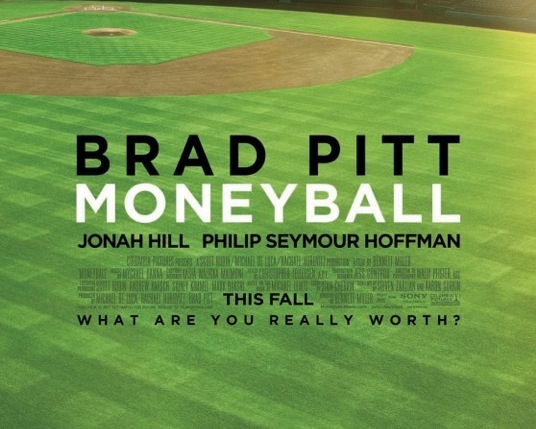 Which is why I didn’t go see Moneyball when it hit theaters last fall. It didn’t help that I didn’t have a good feeling about the actors involved in the movie. When I found out that Jonah Hill would be starring in a movie that wasn’t supposed to be funny, I figured I’d skip it, because I saw a movie where Jonah Hill was trying to be funny and it turned out to be “Evan Almighty”.